In recent years, the more mature takes on the holiday film come from a cynical place, where its characters must learn the true meaning of Christmas despite their Grinch-like hearts. Disasters like Fred Claus, Surviving Christmas and the more palatable A Very Harold & Kumar 3D Christmas start off cold, building to warm its characters’ and its audience’s hearts like chestnuts roasting on an open fire, despite how false it feels. Yet as The Night Before star Seth Rogen and co-writer Evan Goldberg proved with This Is the End, it’s better for a film to embrace whatever genre it takes on, rather than treat it with a certain level of disgust. 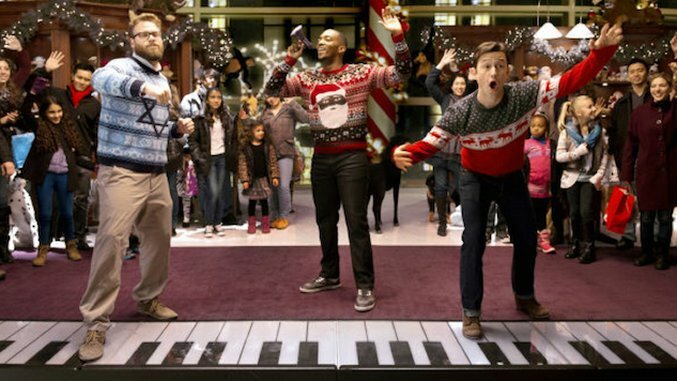 The Night Before earnestly blends the holiday film with the buddy comedy. The result is a Christmas film that focuses on a created family of friends rather than the literal family, and in doing so, makes a surprisingly sincere and funny combination. When Ethan (Joseph Gordon-Levitt) lost his parents during the holidays years ago, his friends Isaac and Chris (Seth Rogen and Anthony Mackie, respectively) decided to cheer him up with a Christmas Eve full of drinking, karaoke and Chinese food. After making this a yearly tradition for 14 years, the group is growing up and growing out of this December 24th event. Isaac is expecting his first child with his wife Betsy (Jillian Bell) and he’s freaking out about it. Chris is now a famous football player, but he’s shooting steroids and his teammates have yet to accept him even after years playing together. But Ethan remains in his funk, a 33-year-old elf-for-hire for holiday parties, a musician who doesn’t like to perform in public and with a girlfriend who recently broke up with him over commitment issues. To end this tradition on a high note, Ethan steals three tickets to the ultimate holiday party he and his friends have been pining to attend for years: the Nutcracka Ball. The Night Before director and co-writer Jonathan Levine reunites with his 50/50 crew of Rogen and Gordon-Levitt, and they continue to work incredibly well together with Mackie added in the mix. Even in Levine’s lesser films like The Wackness and Warm Bodies, his ability to create exceptional friendships remains his strong point. Levine, Goldberg and co-writers Kyle Hunter and Ariel Shaffir write Ethan, Isaac and Chris so that glimpsing a view of their past and hearing stories of their meeting over games of GoldenEye is just as fascinating as watching Rogen continuously take whatever he can from a box full of every drug known to man. The Night Before is hardly a deep film, but it knows how to nicely combine the characters’ real-world problems with the events of the night. The closer the group gets to the Nutcracka Ball, the more we start to understand this unlikely friendship that has remained since high school and the individual problems become genuinely interesting. Sure, there’s plenty of Rogen tripping balls and the friends playing Kanye West’s “Runaway” on FAO Schwarz’s giant piano, but it’s the core relationship that makes The Night Before so endearing and fun. Despite how many various adventures and detours this trio goes on, the characters they run into rarely feel one-dimensional and The Night Before never stuffs itself beyond what it can control. For example, Ilana Glazer appears several times throughout the evening as a woman who looks up to the Grinch, Home Alone’s Sticky Bandits and Die Hard’s Hans Gruber, her actions constantly filled with homages to her favorite holiday villains. Even two drunk Santas—played by Jason Mantzoukas and Jason Jones—have a moment in their one scene where they present themselves as more than just a duo on a pub crawl peeing on the street. As can be expected from your typical Rogen film, The Night Before is packed with incredible cameos that always charm in their perfect casting. Primary of these is Michael Shannon as Mr. Green, a drug dealer who watches over these friends throughout the night. Shannon brilliantly plays off his intense persona, balancing borderline terror with a hint of sadness and wisdom that steals the show every time he appears. The Night Before is the rare holiday film for an adult audience that is both hilarious and warm. It revels in the season and creates a wonderful buddy comedy that deserves a spot in future holiday viewings, among the films it clearly loves so much.